First included within the boundaries of New Zealand in 1901, the islands were governed by a Resident Commissioner until 1946. 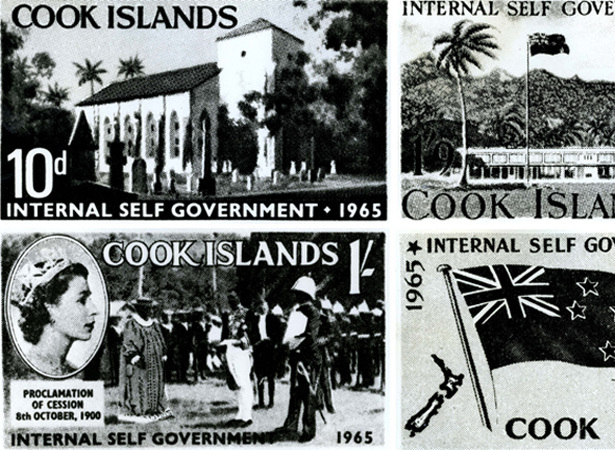 When they achieved self-government, Cook Islanders remained New Zealand citizens. New Zealand’s formal ties with the Cook Islands began as a result of a petition it had induced some local chiefs to present. In 1901 the Federal Parliament of the Cooks was abolished. The islands were now governed by a Resident Commissioner sent to Rarotonga by the New Zealand government. Resident agents were appointed in most of the outer islands. As decolonisation gathered pace around the world after the Second World War, steps were taken towards establishing responsible internal self-government in the Cooks. A Legislative Council constituted in 1946 met annually in Rarotonga, initially as a largely advisory group. In 1957 a representative Legislative Assembly of the Cook Islands with increased legislative powers was created. In 1962 the Assembly declared its intention to achieve internal self-government, with Cook Islanders retaining their New Zealand citizenship. At its 1963 session the Assembly chose a Leader of Government and four other members to form a new Executive Committee or ‘shadow cabinet’. Under an agreed timetable for constitutional development, full internal self-government would be granted in 1965. Under the terms of New Zealand’s Cook Islands Constitution Act 1964, an elected Legislative Assembly would make laws for the Cooks. Executive government was to be controlled by a cabinet chosen from members of the Assembly and headed by a Premier. New Zealand retained control of Cook Islands’ external affairs and would continue to make three-yearly grants towards its budget. A New Zealand official would both represent the Queen as head of state and act as this country’s representative in the Cooks. By the late 1980s the majority of ‘Cook Islanders’ lived in the North Island of New Zealand. In 2013 the population of the Cook Islands was less than 14,000, while 62,000 people of ‘Cook Islands Māori’ descent lived in New Zealand. We have 1 article, related to Cook Islands achieves self-government.